Fortification means to intensify or strengthen the medication, to achieve adequate drug concentration. Fortified antimicrobials are not commercially available, thus should be, prepared of optimal constitution in a sterile pharmaceutical dispensary. This article provides guidelines on topical fortified therapy dosage concentration and methodology of preparation of drugs for patients with infectious keratitis. Acquaintance on fortified antimicrobial medication, its appropriate usage and timely intervention will help us to treat most of the resistant microbial keratitis and prevent the need for surgical intervention. Most of our available ophthalmic antibiotic preparations are in 0.3% concentration, which is not sufficient to attain minimum inhibitory concentration to halt the progression of resistant keratitis. Fortification means to intensify or strengthen the medication to achieve adequate drug concentration. Fortified medications have better inhibitory effect on pathogens than the commercially available topical medications. Fortified antimicrobials are not commercially available, thus should be prepared of optimal constitution in a sterile pharmaceutical dispensary. For preparation of fortified antibiotics, a standard parenteral or lyophilized antibiotic preparation is combined with a compatible vehicle such that the antibiotic does not precipitate. For drugs that are available only in parenteral form. For example - vancomycin and amphotericin B.
Shelf-life: Refrigerate and shake well before instillation. Add 33 ml of 0.9% sodium chloride for injection USP (no preservatives) or artificial tears to produce a solution of 15 mg/ml. Add 20 ml of 0.9% sodium chloride for injection USP (no preservatives) or artificial tears to produce a solution of 25 mg/ml. Add 10 ml of 0.9% sodium chloride for injection USP (no preservatives) or artificial tears to produce a solution of 50 mg/ml. Storage: Refrigerate and shake well before instillation. Method: Can be used directly from parenteral linezolid available as 200 mg/100 ml (2 mg/ml) IV infusion. Method: It is prepared from parenteral colistimethate sodium powder (Xylistin) 1 million IU/75 mg and added to 10 ml of distilled water to obtain 7.5 mg/ml (0.75%). 1 ml of the above solution is then added to 3 ml of distilled water to obtain 0.19% colistin drops. Storage: should not be exposed to light. The drops should be inspected at each visit for any turbidity, which may indicate contamination or drug precipitation. There is a rapid increase in bacterial resistance to antibiotics in both systemic and ocular infections worldwide; thus, all medications should be started based on the severity of disease and clinical progression. Fortified drugs should be used with appropriate indication and avoided in self-limiting cases such as conjunctivitis, which will hopefully bring down the extremes of the ever-increasing antibiotic resistance. Acquaintance on fortified antimicrobial medication, its appropriate usage and timely intervention will help us to treat most of the resistant microbial keratitis and prevent the need for surgical intervention. Chiquet C, Romanet JP. Prescribing fortified eye drops. J Fr Ophtalmol. 2007;30:423-30. 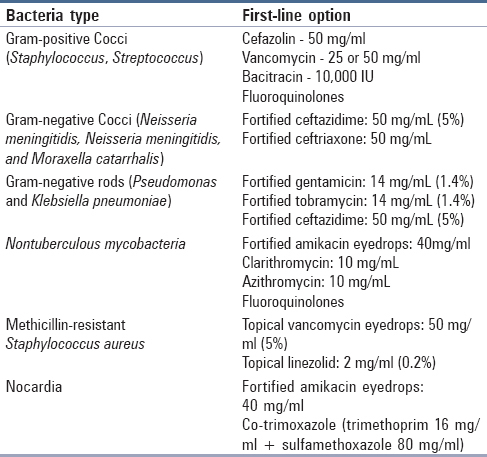 Bremond-Gignac D, Chiambaretta F, Milazzo S. A European perspective on topical ophthalmic antibiotics: Current and evolving options. Ophthalmol Eye Dis 2011;3:29-43. Tas T, Kucukbayrak A, Hakyemez IN, Mengeloglu FZ, Simavli H, Ozyalvacli G, et al. Linezolid versus vancomycin for the treatment of methicillin-resistant Staphylococcus aureus keratitis in rabbits. Cornea 2013;32:1052-7. Available from: https://www.aao.org/preferred-practice-pattern/bacterial-keratitis-ppp--2013. [Last accessed on 2018 Jul 20]. Jain R, Murthy SI, Motukupally S. Clinical outcomes of corneal graft infections caused by Multi-drug resistant Pseudomonas aeruginosa keratitis. Cornea 2014;33: 22-26. Dupuis A, Tournier N, Le Moal G, and Venisse N. Preparation and Stability of Voriconazole Eye Drop Solution. Antimicrobial Agents and Chemotherapy, 2008;53: pp.798-9. Jay H. Krachmer, Mark J Mannis, Edward J Holland. Cornea. Vol 1. 3rd ed. St Louis, United States: Elsevier - Health Sciences Division; 2010. Chapter 77: Bacterial keratitis. [Table 77].4; p.934.